You know, with Halloween over, most news organizations begin to celebrate the Christmas season with lists about the best songs, decorations, and scenes from movies and TV shows of the Yuletide season. BUT NOT THIS NEWS ORGANIZATION! For this list, we’re going to take a look at some of the best scenes in movies and TV shows that are about or take place during one of the most underrated holidays of all time: Thanksgiving. There will also be links to these videos so you can watch them yourselves, and not just take our word for it (though you probably should). So, without further ado, here’s our alphabetical list of the Best Thanksgiving Scenes in Movies & TV Shows! Wow… that’s a mouthful. While this might be an easy one, holidays are about tradition. And nothing says ‘tradition’ more than this classic Thanksgiving special (along with some buttered toast and popcorn for Thanksgiving dinner). In this installment in the Charlie Brown saga, Charlie Brown must make preparations for Thanksgiving dinner as fast as possible when Peppermint Patty invites herself and a few friends over that afternoon. With the help of Snoopy and Woodstock, “Chuck” makes preparations for the meal to take place around a ping-pong table with jelly beans and pretzel sticks serving as the actual meal. Just wait until you see Peppermint Patty’s reaction to all of it in this hilarious scene. Some people gather around close family and friends at Thanksgiving, but that’s just not the gang’s style in this 2013 episode of the ninth season. In it, the gang decides to throw a Thanksgiving dinner with all the people they have wronged in the past. Unfortunately, things don’t go as plan as whatever the opposite of a Thanksgiving meal hilariously ensues, such as a food fight ensuing, a room catching on fire, and the gang locking all the people they have wronged in the past in the room on fire. In the end, these terrible people learn a lesson about Thanksgiving that no one should: it’s all about them… and nobody else. While one of the most important elements to a Thanksgiving scene is comedy, something that’s just as important is heart. And plenty of that can be found in the ending scene to John Hughes’ 1987 comedy. In the scene, the two main characters of the film finally make it to Chicago where Neal Page, played by Steve Martin, is able to head home to his family for Thanksgiving dinner. However, after leaving his travelling companion Del Griffith, played by John Candy, at the train station, Neal realizes that Del’s wife has been dead for eight years. Realizing that Del is alone for the holiday, Neal rushes back to the train station and invites him over to his house for Thanksgiving. The movie ends with Neal returning home to his family and introducing them to Del. While it isn’t the funniest of Thanksgiving scenes, it’s definitely one of the most heartwarming. It may be Thanksgiving to you, but to Rocky, it’s just Thursday. 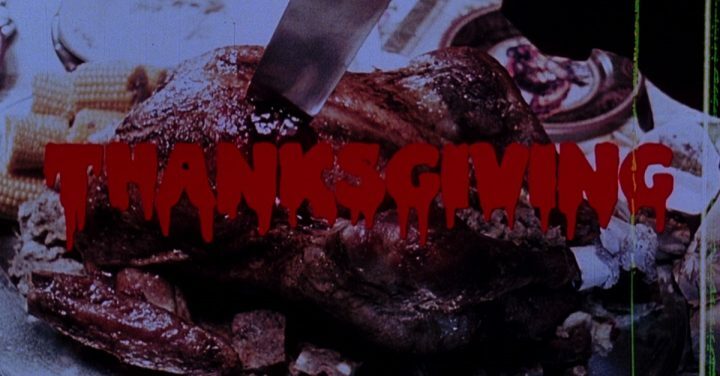 Many people may actually forget that this Best Picture winner has a great Thanksgiving scene that might even remind a few people of their own holiday experiences (…probably). After an argument between Rocky’s love interest, Adrian, played by Talia Shire, and her brother Paulie, played by Burt Young, leads to Paulie throwing the turkey out the backdoor, Rocky, played by Sylvester Stallone, takes Adrian to the ice rink, where a romantic evening between the two ensues. It’s a heartbreaking family drama that turns into a heartwarming romance. Pulling the heart strings is something that makes a Thanksgiving scene that much greater. This is something that this 2009 Best Picture nominated movie knew all too well. When Leigh Anne Tuohy, played by Sandra Bullock, and her family see the 17-year-old Michael Oher, played by Quinton Aaron, shivering on the streets, they offer him a place to spend the night before later asking him to spend the Thanksgiving holiday with them. During their Thanksgiving dinner, the family “joins” Michael at the table, accepting him as a member of the family and thanking God that he found them, and that they found him in this touching scene. Ok, I know this doesn’t ‘technically’ count because this is just a fake trailer for a fake movie, but still, you got to give Eli Roth credit where it’s due. In one of the several fake trailers for this 2007 double-feature tribute to the 70s-exploitation films of the time, Eli Roth’s fake trailer follows a killer who murders his poor victims while dressed as a pilgrim. It’s sick, disgusting, hilariously over-the-top, and nearly gave Grindhouse an NC-17 rating… which is why we are NOT embedding the trailer here. However, those of you who are brave enough can find it on YouTube. And those are some of the best scenes in movies and TV shows that take place during the Thanksgiving holiday. Do you agree with this list… Probably not. Still, be sure to leave a comment below that lets us know what your favorite Thanksgiving scene in a movie or TV show is. And, of course, Happy Thanksgiving!